We do not need any more research about the benefits of continuity of care. The evidence is clear; it is associated with improved preventive and chronic care services, patient and clinician satisfaction, lower hospital utilization, lower costs, and for elderly patients, lower mortality. A recent blog shows how amazingly efficient continuity of care can be. Continuity of care matters more to some patients than others, in particular those with long-term conditions, mental health problems, multimorbidity (several different conditions at the same time), during serious but hopefully shorter term conditions like cancer and during end of life care. Continuity of care makes care more person-centred because getting to know a patient as a person takes time. Continuity of care makes care more efficient because less time is spent repeating a medical history or trying to read it from the notes. Continuity of care makes medical practice safer- we identified lack of continuity as a contributing factor in delayed diagnosis of cancer and introduced changes in our practice which have improved continuity and since then have not had any delayed cancer diagnoses. More GPs working part-time: the rest of the time they are raising children, teaching, commissioning, studying, doing specialist clinics like minor surgery, going on courses, appraising other doctors or being appraised/ revalidated, attending (often compulsory) meetings, etc. An higher turnover of GPs. 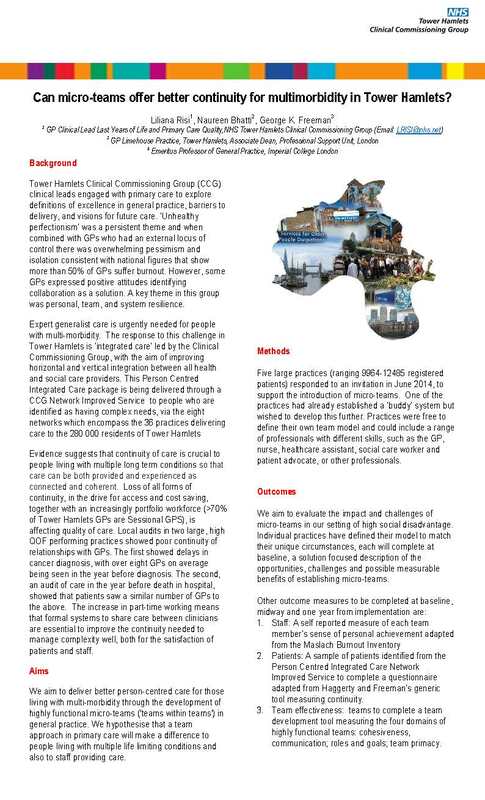 The traditional partnership model gave GPs a long-term interest in and commitment to their practice and they would usually stay there for the duration of their career. Nowadays there are fewer partners and more salaried/ locum doctors who change practice more frequently. Lack of career structure. Practices vary in their commitment to their salaried GPs. Some encourage them to develop their career, take on more responsibility and join the partnership. Others see them as occasional labour and they come and go before patients can benefit from continuity of care. A greater emphasis on access – instead of waiting to see a usual GP, policy-makers -who by and large don’t fall into the categories of patients who most benefit from continuity –have insisted that patients are seen quicker (by anyone) and have pushed for policies like 48 hour access at the expense of continuity. Increasingly multidisciplinary primary care: Practice nurses are managing a lot of chronic disease clinics, pharmacists, nurse-practitioners, physician assistants, and others are seeing patients. Insufficient numbers of GPs. In the UK we are several thousand GPs short of what we need to cover the population. This means that many GPs have more patients registered than they can effectively care for. High turnover of staff. There are far too few GPs and many practices have great difficulty recruiting and are left with short-term doctors filling in for days or weeks at a time. Disease-centred incentives: We are paid for the management of disease, not the care of patients. The two are related, but can be in conflict for example, someone may be tired, anxious, stressed and lonely, but the incentives drive management around blood pressure, cholesterol, and a set of prescribed drugs and they may be sent to a specialist clinic for their disease rather than their GP. Some generalist GPs have become specialists in particular areas, for example dermatology or women’s health and patients may see them instead of their own GP. Some patients choose to see a different GP for particular problems, for example I do a fair few prostate checks on male patients whose usual GP is a woman. Lack of commitment from the managers/ doctors in the organisation. 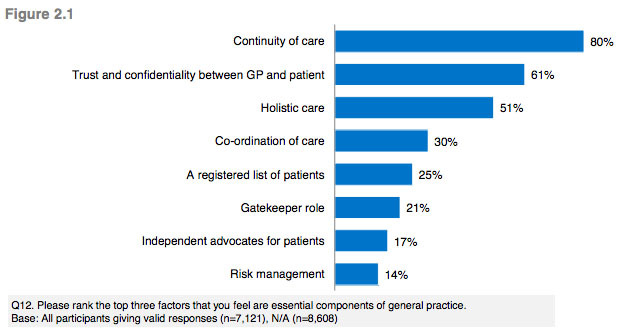 While the large majority of GPs and patients value continuity of care, not all do. It may be that their practice demographic includes lower proportions of vulnerable patients or that they perceived the work involved in improving continuity not worthwhile. They may not believe the evidence in support of continuity to be sufficiently strong. Perverse incentives. Payment by activity rewards a practice for every patient contact. A surgery that offers a walk-in service, where patients turn up and see the next available clinician may have little incentive to change. First of all, better continuity needs commitment from the organisation. Everyone, or at least the majority of people in the organisation, including management, reception and clinical staff need to believe that continuity matters. Everyone has a role in ensuring patients meet with their own doctor or nurse. My practice made the decision to improve continuity after auditing patients who had a delayed diagnosis of cancer and found that a lack of continuity was a common contributing factor. Other practices may discover similar reasons or be motivated by their patient survey or patient participation group or the academic evidence, which I have summarised here. The barriers I’ve described above are not insurmountable. 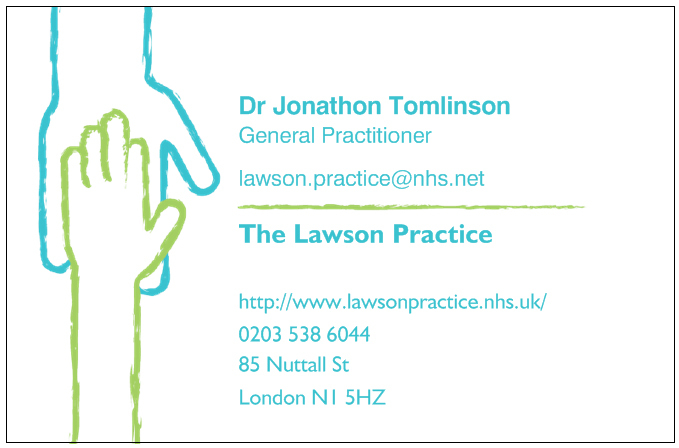 I work in a teaching practice with 13,000 patients, 12 part-time doctors, 2-3 trainees and a 25% annual list turnover. We managed to increase continuity from 50% of all patient contacts to 80% between 2012 and 2014. It was only possible by involving everyone in the practice, especially the reception team. It is important to have on-going discussions about how it is working, especially for new doctors and patients who may not be sure what to do when they see somebody else’s patient. Two doctors have retired and 5(!) have got pregnant in the last 2 years, which has severely tested our efforts – but we haven’t given up! The majority of patients value continuity of care, and this blog written by Trudy, who has epilepsy and OCD is a great example. Every patient needs to know that the organisation values continuity and why. They need to be assured that a commitment to continuity will not bar them from urgent access when they need it. They need to know who is responsible for their care. I made business cards that I give to my patients, which really helps. A commentary from the US by Reena Gupta in 2013 includes other suggestions for improving continuity of care. She begins by saying that if we want to improve continuity we need to be able to measure it and she explains that there is no single measure that is suitable for every organisation. Bristol University Centre for Academic Primary Care have come up with a continuity of care calculator that can be used with the EMIS GP operating system. Whatever system is used, what matters is that continuity is measured and the organisation (and their patients) can set goals and track progress. As we discovered when 5 doctors became pregnant, and 2 long-term partners retired, progress can slip. Another suggestion is to maximise the numbers of days that part-time clinicians spend in their practice. Instead of working 3 or 4 sessions over 2 days, it is better to spread the sessions over 3 or 4 days. For the last two years I have worked only 4 clinical sessions (half days) over 3 days a week. I make about 5-10 calls to my patients each day that I am in, in addition to my face-to-face appointments and I have managed to maintain continuity with about 90% of all routine appointments with my own patients. In Tower Hamlets, clinicians and academics are piloting microteams – where a patient has their own small team, rather than one specific GP. Policy makers need to be aware that continuity of care matters for the most vulnerable patients most of all. They need to be aware that continuity may be the price paid for access. Ill-considered policies like 48 hour GP access put forward by the Labour party undermine continuity of care, especially when so many GPs work part-time. Far better is to ensure that patients have on the day access for urgent problems – by phone in the first instance and face-to-face where necessary. An experienced GP can give advice and treatment or arrange for follow up with the patient’s usual doctor. Providing continuity of care is hardest where there are high turnovers of patients and staff, where recruitment is difficult and patients are most anxious and chaotic. This is typical in deprived areas. Incentives should not reward practices for the good fortune of being situated in a well off, stable community. Policy makers should help promote continuity of care. They can encourage patients to ask, ‘who is my doctor?’ or ‘who is in my team?’ Organisations can be incentivised to promote and measure continuity of care and show – to their patients – what they are doing about it. As Gupta concludes, Few things in medicine have as much evidence supporting their effectiveness as continuity of care. We should promote it, measure it, and do everything we can to make it better. Continuity of care. It matters. Not for every contact – but for many. Even the times when continuity isn’t essential, getting to see the same doc / patient can help relationships to build over time. I’m going to have a look at the Emis continuity calculator and see if we can run this at out practice in Pendle. Heard about Nuka model of care last week. Wonder if continuity in care is central part of this. Will explore.